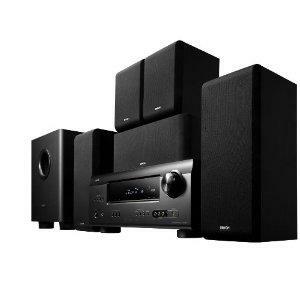 The Denon DHT-391XP is a six hundred fifty watt 5.1 channel home theater system that offers five speakers and a hundred watt powered subwoofer. You’ll get a variety of decoders including Dolby Digital Plus and Dolby Digital Surround EX, four HDMI 1.4a Repeater inputs, one HDMI output, 3D Pass Through capability, the Equal Power Amp design to improve sound detail, support for High Definition audio, both Deep Color and x.v. Color support, and support for optional iPod docks.